So, as a nice break from all that, I decided to watch a show I could download from Netflix. My choice? “Dead Like Me ”. I’d started it before, but for some reason let it drop off my radar for a while. I picked it up again, and I’m glad I did. The main character of the show is Georgia Lass (aka “George”), who dies in the first episode after being hit by the flaming toilet seat re-entering the atmosphere from a Soviet space station. Now, normally when people die in this show’s “universe”, a person comes up to them and touches them. That person is a Grim Reaper, and is actually “reaping” their soul so that the death they’re about to have won’t be painful. After death, the Grim Reaper helps the dead person “move on” to the next phase of their existence. But, that doesn’t happen to everyone. In George’s case, she’s told that she has to now take the role of a Grim Reaper, and joins a group of Grim Reapers to preform this task. They meet at “Der Waffle Haus” every day to get their assignments from Rube, the leader of the group. This might sound like a really strange premise for a show, and it is, but it’s a lot of fun. It only lasted two seasons, but it’s well worth watching. 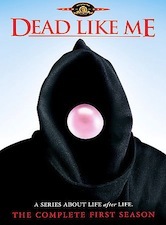 One additional things: They came out with a follow-on movie in 2009 called Dead Like Me: Life After Death. It was disappointing, and didn’t have the same flair of the rest of the show. Nearly every regular character made it into the movie, but a couple didn’t. After seeing the movie, I’d say that they did it because of the script….but who knows? 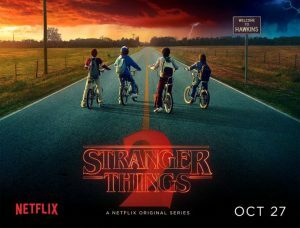 I think it’s safe if you skip the movie, and just enjoy the two seasons.